Product prices and availability are accurate as of 2019-04-23 14:17:40 EDT and are subject to change. Any price and availability information displayed on http://www.amazon.com/ at the time of purchase will apply to the purchase of this product. 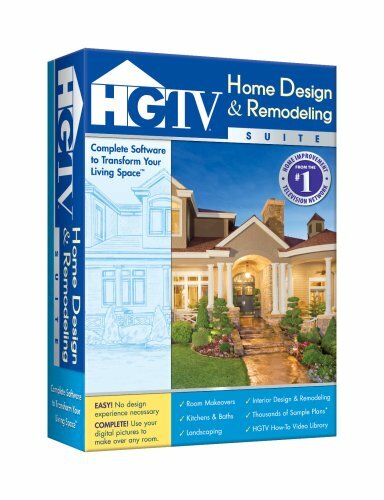 Take a fresh approach to the way you live with HGTV Home Design & Remodeling Suite. This innovation in home design software delivers the powerful tools and inspiration you need to transform your living space, plus expert help to get the job done right. With HGTV Home Design & Remodeling Suite, you can tackle home improvement projects with ease, make your home energy efficient with new appliances, breathe new life into an old kitchen or bath and so much more. You can even design your dream home, from scratch. No design experience necessary - with the wizard-driven interface, all you have to do is point and click! Design Your Dream Home with Help from HGTV. Easily draw out your room. Then choose materials and furnishings just by dragging and dropping. Click to enlarge. Perfect for creating a new living space. Click to enlarge. All the tools for creating winning kitchens & baths. Click to enlarge. Are you looking to update a living room, bedroom or other space but aren't really sure where to begin? 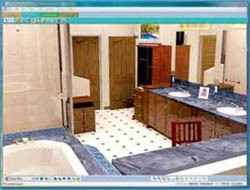 HGTV Home Design & Remodeling Suite makes the process a cinch. Easily draw out your room. Then choose materials and furnishings just by dragging and dropping. This new software is perfect for creating a new living space; adding a fireplace; making your home energy efficient with new appliances; replacing countertops, cabinetry and fixtures; and enhancing any room in your house with a brand new look. You can import digital photos of your home's exterior or interior and instantly change paint colors. You can even design your dream home from scratch. And it's easier than ever--no design experience necessary! Just point and click! Easy Room Makeovers with multiple options--or you can start with your own digital pictures. Import digital photos of home furnishings--or family photos--into your one-of-a-kind design! 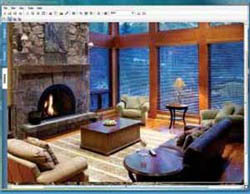 Create virtual tours to visualize your finished living space before you ever start your project. Click to enlarge. 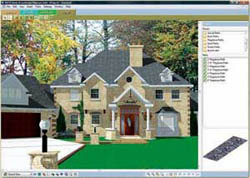 HGTV Home Design & Remodeling software makes it easy to design the kitchen of your dreams. Click to enlarge. Hundreds of 3D Appliances, Furnishings, Lighting and More! Customize your space by selecting countertops, furniture and appliances in every style imaginable. Everything you need to plan, design, customize and create. 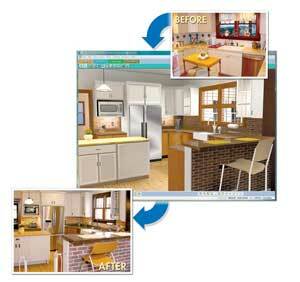 HGTV Home Design & Remodeling software makes it easy to design the kitchen of your dreams. Easily refinish cabinets, replace countertops, update appliances, and more. Even add decorative hoods and backsplashes and more functional eating areas. Plan Your HGTV Green Kitchen. Kitchens are the energy hog of the home. Between refrigerators and the ovens, cooktops and dishwashers, microwaves and small appliances, it's easy to see how a kitchen can cook up most of your energy bill. HGTV Home Design & Remodeling software will help you to plan and visualize a ne, updated kitchen, complete with new, more energy-efficient appliances. Wizard-Driven Interface makes any project fast and easy. There's even free tech support! Photorealistic 3D Technology for unparalleled visualization capacity. 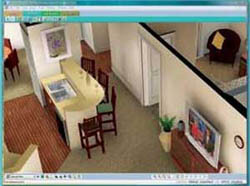 3D Real View makes it possible to conduct your own virtual walkaround. Choose from hundreds of plants, fences, gates and more to plan beautiful, functional landscapes. Plan and visualize a new, updated kitchen, complete with new, more energy-efficient appliances. It's easy to plan even the most challenging project. Click to enlarge. The changes you make in 3D are simultaneously made to your 2D plan--automatically. Click to enlarge. Hundreds of 3D models to choose from. Click to enlarge. Take a digital picture of any room and visualize your new space. The changes you make in 3D are simultaneously made to your 2D plan--automatically. 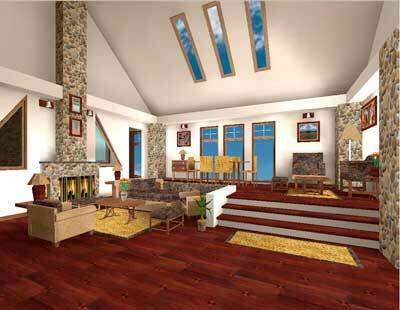 Create virtual tours to visualize your finished living space before you ever start your project. Visualize your home's interior at different times of day. Easily draw interior and exterior walls that automatically connect and repair. Use the Door Wizard to add simple doors, bi-fold doors, French doors, sliding doors, garage doors and more. Just click along a wall to insert casement, hung, sliding, bay, vent, hopper or louvered windows, plus windows in virtually any shape.